The National Basketball Association is one of the world’s most popular sports leagues. NBA players are stars, the best among them are great leaders and the league’s champions often become inspirational heroes. Over the years, many of those who have risen to the top of the basketball world have had hot and cold relationships with media. Yet those relationships have managed to provide fans a little insight into the minds of the champions and given the world some of the most motivational and inspirational quotes in sports history. NBA players are some of the world’s best paid athletes and earn their fortune by doing more than just playing the game. They earn it by providing great examples of what it means to be a leader and a champion, and by inspiring us with their play and their words. Larry Bird did exactly that. 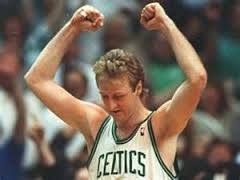 He joined the Boston Celtics after being drafted sixth overall in 1978 and was a star for the Celtics for thirteen seasons, winning three NBA championships. Bird was a 12-time NBA All-Star, the league’s Most Valuable Player three consecutive times from 1984 to 1986, and a two-time NBA Finals MVP. Age and injuries caught up with Bird over time, but he never lost his competitive edge and still applies it as an executive with the Indiana Pacers to this day. Michael Jordan is widely considered the best basketball player of all time. He won six championships with the Chicago Bulls, five Most Valuable Player Awards, was named to the All-NBA First Team ten times and earned nine All-Defensive First Team honors. Jordan made 14 NBA All-Star Game appearances, won three All-Star Game MVP Awards, ten scoring titles, and three steals titles. He won six NBA Finals MVP Awards, and was named the 1988 NBA Defensive Player of the Year. He was also somewhat superstitious, and reportedly followed the unusual ritual of wearing his shorts from college under his uniform throughout his career. Many of Kareem Abdul-Jabbar’s peers consider him to be the best basketball players of all time and he was all about the team. Abdul-Jabbar won a record six-time NBA Most Valuable Player awards, was named to a record 19-time NBA All-Star teams, and was a 15-time All-NBA selection. He made the NBA All-Defensive Team 11 times and won six NBA championships, being named NBA Finals MVP twice. Even when he stopped playing, Abdul-Jabbar kept on winning, capturing two titles as an NBA assistant coach. If not the best big man of his era, Tim Duncan was certainly the most fundamentally solid. He played his entire 19-year career with the San Antonio Spurs and won five NBA championships with the club. Duncan was named NBA MVP twice, NBA Finals MVP three times, and also won the NBA Rookie of the Year award. He was a 15-time NBA All-Star and competed at an extremely high level right up until his retirement last season. Charles Barkley never won an NBA title, but he is still widely considered one of the greatest NBA players in history. Always outspoken and certainly passionate, Barkley was an 11-time NBA All-Star, 1991 All-Star MVP and 1993 NBA Most Valuable Player. He also managed to win two Olympic gold medals, in 1992 and 1996, and still provides memorable quotes as a member of the basketball media today. Dennis Rodman is a true character and without a doubt one of the greatest defensive players in NBA history. He was named to the NBA All-Defensive First Team seven times and won the NBA Defensive Player of the Year Award twice. He led the NBA in rebounds for seven consecutive years and won five NBA titles in his career. He also dyed his hair with crazy colors, had numerous piercings and tattoos, and had a reputation as an instigator with other players and referees. A crossover star, he also had high-profile affairs with Madonna and married Carmen Electra. Rodman has struggled with alcohol addiction in his post-basketball life, but remains as quotable a basketball star and pop-culture icon as there is. Kobe Bryant certainly believed in himself, taking up the mantle as the best player in the league when Michael Jordan retired. He played his entire 20-year career with the Los Angeles Lakers after joining the league directly out of high school. When it was all said and done, he won five NBA championships and was an 18-time All-Star. Bryant was named to the All-NBA Team 15 times and the All-Defensive team 12 times. He also led the NBA in scoring twice. Bryant knows all there is to know about winning, and developed a reputation as one of the hardest working players in the league throughout his career.